Lufthansa First Class passengers and Lufthansa Private Jet guests can now enliven the waiting time before their next take-off with a special experience – by taking a Porsche 911 or Panamera for a spin through Munich, the sub-Alpine landscape or Lower Bavaria. The Porsche First Class Excitement offer is available for all Lufthansa, Swiss or Austrian Airlines passengers, Lufthansa HON Circle members or Lufthansa Private Jet guests who possess a valid First Class boarding ticket for that day. “With Lufthansa First Class, we offer our customers the highest travel quality. This is suitably complemented by the exclusive offer from Porsche, which turns the waiting period before take-off into a luxurious experience”, says Thomas Klühr, the Lufthansa Passage Executive Board member for Finances & Munich Hub. And this is how it works: The Lufthansa First Class Personal Assistant accepts reservations in the First Class Lounge and arranges the car rental. Passengers can book their sports car online before the flight, or make a spontaneous on-the-spot decision as long as the chosen offer is available. Back at the airport, your First Class flight starts as usual. A limousine takes passengers straight to the apron position beside the aircraft. Once on board, the passengers enjoy First Class menus by famous star chefs and a selection of premier wines. A bed two metres long rounds off a relaxed flying experience. 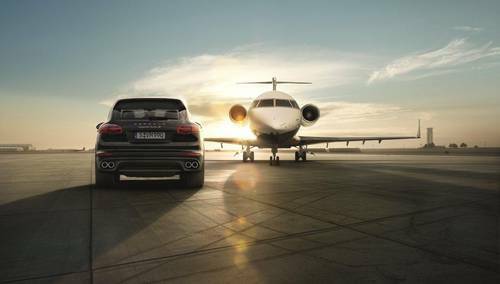 Porsche First Class Excitement can now be booked at Frankfurt airport as well as in Munich. The Porsche of your choice can be booked at LH.com/porsche or via +49 6171 68 1377. A 3-hour rental including 150 kilometres, petrol and insurance costs EUR 99.11 (EUR 0,99 additional costs per km, deductible EUR 1,500).